Yellow loosestrife (Lysimachia terrestris) growing in a cranberry bed. Yellow loosestrife is also called swamp candle or yellowweed and is a herbaceous perennial in the primrose family (Primulaceae). 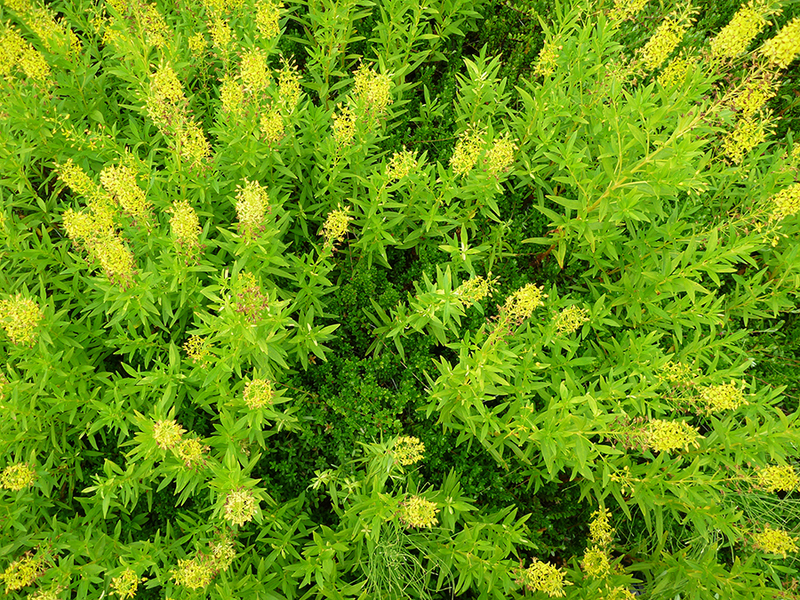 It is one of several Lysimachia species (L. punctate—yellow loosestrife and L. vulgaris—garden loosestrife) that have become aggressive weeds in PNW wetlands. Although frequently reported as a native species, it more likely spread to the PNW on infested cranberry vines from the East Coast. Yellow loosestrife is a serious weed in all cranberry-growing regions in North America. Without control, as shown in this photo, yellow loosestrife quickly overwhelms a cranberry bed reducing yield to almost nothing. Photo and caption by Kim Patten, © Washington State University. This handbook is designed as a quick and ready reference for weed control practices and herbicides used in various cropping systems or sites in Idaho, Oregon, and Washington. This handbook will be useful to Extension agents, company field representatives, commercial spray applicators and consultants, herbicide dealers, teachers, and producers. Recommendations are based on research results from the Agricultural Experiment Stations and Extension Services of Oregon, Idaho, and Washington. A few suggestions are included from research conducted in other states, and from U.S. Department of Agriculture research centers. In all cases, authors make every effort to list only registered herbicides, and to ensure that the information conforms to product labels and company recommendations. Some sections may include additional online content, such as photos and links to related websites, publications, and other resources. Please send comments or suggestions to handbook editor Ed Peachey (ed.peachey@oregonstate.edu). This handbook is not intended as a complete guide to weed control or herbicide use. Authors have assembled the most reliable information available to them at the time of publication. Due to constantly changing laws and regulations, authors can assume no liability for the recommendations. Any use of a pesticide contrary to instructions on the printed label is illegal and is not recommended. Before using any herbicide, read the label on the container. Before a herbicide can be recommended for a specific use, it must be thoroughly tested. The recommendation on the manufacturer’s label, when followed, can prevent many problems arising from the improper use of a chemical. Trade-name products and services are mentioned as illustrations only. This does not mean that the participating Extension Services endorse these products and services or that they intend to discriminate against products and services not mentioned. Trade names (brand names) of some commercial pesticides are used in portions of this handbook to help identify the common name used by the Weed Science Society of America (WSSA).